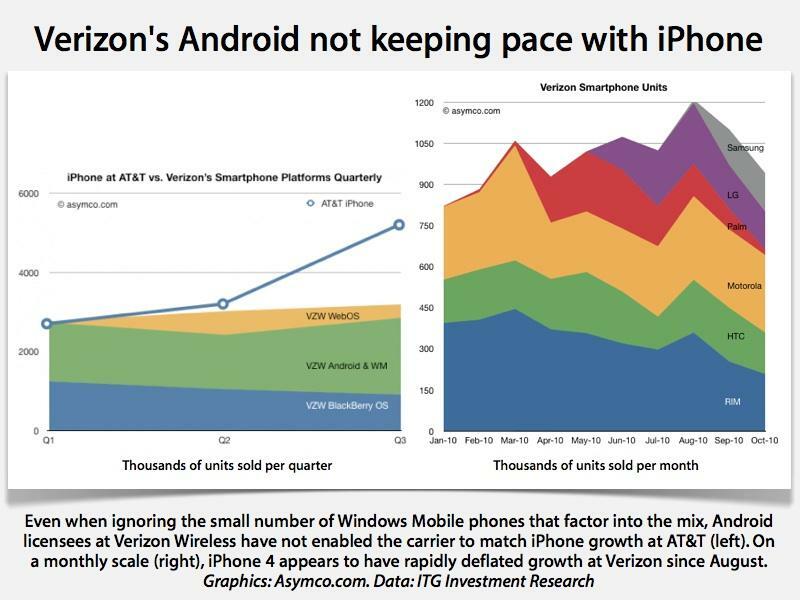 According to new analysis by Asymco, data published earlier by ITG Investment Research analyst Matthew Goodman shows just how much the iPhone has done to blunt Verizon's growth, and how little Android has done to help Verizon. Previously, AppleInsider reported how the same data indicated that Verizon's relationship with RIM's BlackBerry was being strained by Android. BlackBerry made up over 90 percent of the carrier's smartphone mix as recently as October 2009, but was rapidly displaced by Android-based phones starting that same month with the arrival of Motorola's Droid, which was accompanied by a media blitz paid for by Verizon. Verizon shifted its marketing efforts from BlackBerry to focus on Android because RIM was unable to deliver a phone that could compete against the iPhone. The 2008 holiday season's BlackBerry Storm was a particularly bad launch for the carrier. 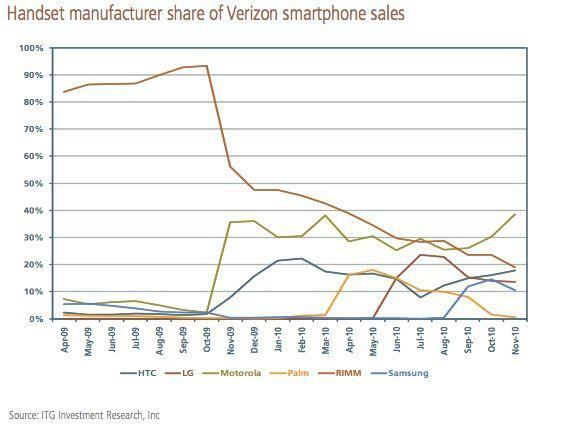 A year later, Verizon's smartphone selection is now split by RIM and each of the carrier's Android licensees: Motorola, HTC, LG and Samsung. However, there's valid data for explaining why Verizon is seeking to make another platform jump, this time from Android to Apple' iOS. The carrier has already started selling the iPad, and is now rumored to be launching Apple's iPhone early next year. Asymco points out, graphically, that Verizon's smartphone performance with BlackBerry, Android, and Palm's webOS simply pales in comparison to AT&T's performance with Apple's iPhone. "Verizons volumes grew from 2.7 million in Q1 to 3.3 million in Q3," the site reports. "Not a bad story in itself. However, the iPhone at AT&T went from 2.7 million to 5.7 million in the same time frame. Relative to just the iPhone, Verizon has been underperforming over the last quarter." Unlike popular comparisons of global device activation numbers, mobile web "market share" and mobile advertising analytics, all of which can gerrymander markets that either include or exclude iPods and iPads and other devices, or group third world cheap devices into the same pool as high end smartphones, the report's comparison of AT&T and Verizon is one of the clearest looks yet at how iPhone sales compare to Android-based smartphones in similar circumstances. Both carriers cover the same population and are similarly sized, with Verizon hosting 92.1 million subscribers and AT&T serving 90.1 million. Together, "AT&T and Verizon Wireless raked in 75% of all mobile data revenue in Q2 of 2010 and account for 62% of the U.S. wireless customer base," the report notes. When looking at data by month, rather than quarterly figures, Asymco points out that Verizon's unit sales growth "hit a wall in August. Following widespread iPhone 4 availability, sales dropped." That wall was also the last straw for Palm's webOS, which since August has trickled off to nearly nothing after achieving pre-iPhone 4 sales that exceeded HTC to become Verizon's third best smartphone maker. The observation that Android isn't competing as well as Verizon once hoped, allowing the iPhone to steal Verizon's growth is "strike one" the report states. A second strike against the carrier is that, despite now having five major hardware makers in its stable, none of these are driving Verizon's unit sales growth. Verizon's former reliance upon BlackBerry sales was not a problem because RIM was partnering with the carrier to provide "a product narrowly defined around messaging," the report stated. With Android, "Verizon is facing the prospect of a single OS supplier who may or may not maintain alignment with Verizons core profit algorithm. If they diverge, Verizons bargaining power will be strictly limited." Strike three, the site states, is that Android is simply not competitive with Apple's iPhone. "In an apples-to-apples comparison," the report states, "in Q3 the iPhone at AT&T outsold Android at Verizon (remember, same addressable market) by a factor of 2.5. This is with a variety of devices and vendors thrown in the market. We hardly ever get to see this finely grained a comparison when looking at platforms." The report added, "whether its due to brand, visibility or performance and in spite of 'antennagate' the iPhone is cleaning up." "It is perhaps coincidental that the rumors of a Verizon deal with Apple seem to have started in earnest right after August," the report said. "Its thin, circumstantial evidence, but the only evidence we have to corroborate the data above is that Verizon has been signaling more desperation." To Verizon, the report added, "Apple may be the devil, but so could be Google. Apple was predictably evil. But Google? The devil you know is perhaps better than the one you cant predict. "Whats more, the devil Apple seems to be helping your worst enemy way too much and the unpredictable one does not seem to help all that much." The report concludes, "Verizon striking out means they need to change the way they play. The iPhone is a new ball game."